The MMR vaccine is targeted at measles, mumps and rubella. The latter, rubella, is a cause of abortions and developmental defects in children of mothers who are infected with the virus during the first twenty weeks of pregnancy. The rubella component of the MMR vaccine is targeted to mothers to counter infection during their first two trimesters of pregnancy. Infection during the first trimester results in about a half of the infants being affected, falling to about one-quarter when infection occurs during the second trimester, with few effects observed for infection occurring after 20 weeks. 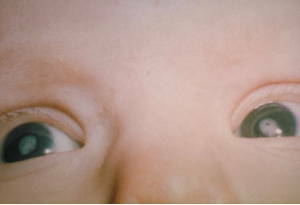 Somewhat less than one-half have eye abnormalities of various kinds, particularly cataracts (see illustration above) and microphthalmia (small eyes). Rarer effects that can also be present include mental retardation, other eye defects, enlarged livers, under-sized jaws among others. There is a possible link to some cases of schizophrenia which I may explore in another article. 85% of infants infected during the first trimester of pregnancy will be born with some type of birth defect, including deafness, eye defects, heart defects, mental retardation, and more. The virus can be passed from person to person, with people being most contagious from a week before symptoms appears to a week after. Infants with CRS, however, can infect others through shedding the virus through urine or nasal or throat fluids for up to a year. An obvious concern is passing the infection to a pregnant mother. New Zealand has experienced several epidemics of rubella, with particularly large ones in 1959/60 and 1963/4. Since 1970, rubella vaccination has been part of the vaccine schedule in New Zealand. Outbreaks have been observed in 1990, 1993 and 1995, which have in part been attributed to the fuss following Wakesfield’s now retracted study. Approximately 1600 laboratory reported cases were noted in 1995, prior to formal notification being required. A study by Liggins and Phillips published in 1963 examines the 1959/60 epidemic, reporting a survey of 10 general practitioners over the period of a year peaking at 50 cases observed per week. Of these cases, 89 fit the criteria for their survey, which included accurately knowing date of appearance of the characteristic rash. Of the initial 89, 15 had therapeutic abortions and 7 spontaneously aborted, leaving 69 infants for study. Of these 67, 3 died and 12 had defects of various types. 8 of the 12 with defects had multiple defects. This is from 10 GPs surveyed: scaling it up to the whole country gives some general idea of the potential impact of this illness in the absence of vaccination. Some local readers may recognise the name of the first author, now Sir Graham Liggins FRS, Emeritus Professor at the University of Auckland, in the Liggins Institute. There were 30,000 pregnancies affected out of 12.5 million rubella cases, including 2,000 cases of encephalitis. Of these pregnancies, 5000 women had surgical abortions, over 6000 women had spontaneous abortions and among the 20,000 infants who survived pregnancy, 11,600 were deaf, 3,580 were blind and 1,800 mentally retarded. It is interesting to see this same difficulty expressed in Liggins & Phillips’ 1963 paper, who take to indirectly inferring past major epidemics through another researcher’s survey of peak incidence’s of deafness. Like other illnesses, rubella is periodic in that in the absence of vaccination epidemics occur every 6-9 years. While I was still in the maternity home they detected cataracts on her eyes and she had a heart murmur and they felt that the outlook was very bleak, they didn’t think she would survive and they thought that she would be severely mentally retarded. This was an absolutely devastating experience for me. It made me grow up in a very big way as you can imagine as a 19 year old. I was devastated at having produced a child so severely disabled, and had a huge sense of guilt; it took me a long time to resolve. My daughter now is 33. She does not speak, she has no eyesight at all, she is completely deaf, her sensory input is through vibration and smell. As far as activities, one of the common things she does is puzzles and the sort of puzzles that you would give to a 2 year old, you know the wooden type puzzles which she does all by touch. There is also the hurt, that the relationship of a mother and a child is never able to get established, because of her disability, so that’s another, another grief. While one might argue that statistically these events are rare, the cost–financial and personal–of raising a disabled child is high and life-long. 2. After birth, an open ’shunt’ that allows blood to pass directly from the pulmonary artery to the aortic arch closes. This shunt allows most of the blood passing through the unborn infant’s heart to bypass the lungs. In about one-half of ’rubella kids’ this remains open, which can lead to shortness of breath, so-called heart murmur, an enlarged heart, arrhythmia and slow growth. Thank you for countering the claim of the other blogger on Sciblogs. I haven’t yet registered so I was unable to post a comment over there bemoaning his irresponsible claims about the diseases that vaccines prevent. I couldn’t believe that Sciblogs would allow that unscientifically-based blog post in the first place. 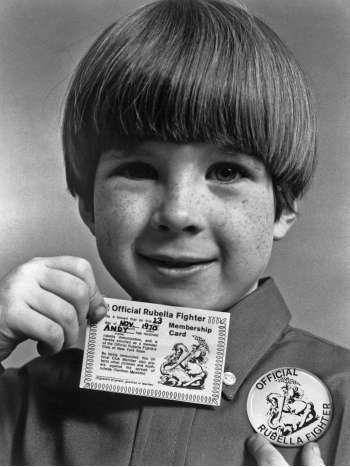 Hi–looking for some rubella images and found this. Rubella (or German measles as people knew it before the vaccine) had really been forgotten–Zika is bringing it into the news which I suspect that you have noticed as well. So interesting to hear from you as a “rubella kid.” I wrote a history of German measles from its discoveries through the 1960s epidemics and the early abortion rights and disabilities rights movements in the US and the vaccine. It’s titled Dangerous Pregnancies. It’s available in paper and as an e-book. Thanks for writing. How quickly some people forget the serious damage that used to be done by diseases we now have under fairly good control. I remember my sister getting German Measles (as it was then called) during the 59/60 outbreak and my mother rang around and had a party for my sister, so lots of other girls could catch it too, and thereby get immunity so they couldn’t catch it later when they were pregnant. I particularly remember the deep unfairness of my sister having a party when it wasn’t her birthday, but in later years I saw the wisdom of what my mother and the mothers of my sister’s friends had done. There was no alternative then to actually having the infection. I guess it’s one of those unfortunate quirks about the success of vaccines – the successful vaccines tend to make many forget how bad the effects of the diseases the vaccines target could be. It’s sadly a recurring theme to see a few parents elect not to vaccinate their children, but deeply regret their decision once when they see the effect of the disease on their child. I think, too, that people may not realise how much effort went into making these vaccines, and that the medical research community generally doesn’t put in that kind of effort unless it’s something that wants attending to.